I’m sure all of you have been enjoying spending time with the Zephyrites and the Crown Pavilion. I must admit, I’ve thoroughly enjoyed having both of these here to dabble in. My journey began with taking care of Sky Crystals with my wife (on Briony). We had quite a bit of fun exploring, as the Labyrinthine Cliffs would be the most beautiful place in all of Guild Wars 2, as far as I’m concerned. It didn’t take us long to complete that, the master sky crystals, and many of the other minor achievements. Progress, progress, progress! Of course, I held back in fear (yeah, I still do that in spite of my past post on the matter) of how hard it will be. The Gauntlet seemed terrifying to me. I did the Boss Blitz quite frequently and am at the point where I actually find it rather boring (overplayed it much? ), but the Gauntlet was a whole new level of challenge! ArenaNet did an amazing job on ensuring that it included actual mechanics instead of spamming the same button over and over. Once you had the mechanics figured out, it got a lot easier, other than Liadri. Now, if you don’t know what the Gauntlet is and still haven’t tried it, just go for it. You have nothing to lose. Seriously. Go into the Crown Pavilion, follow one of the walkways to the outer edge, and go up your next ramp (it doesn’t matter which one). Talk to the Fight Master to choose your battle, and talk to the Ringmaster to go into the battle. Just do it because you won’t regret it. It’s some of the most fun I’ve had in a long time! So, going back to that evil queen of darkness we know as Liadri (who’s actually a really pretty character they designed, if you ask me). You can find guides for every single challenge in the Gauntlet, but Liadri is one that still perplexes people. She’s a little bit more unique and really depends on your profession, how you’re going to handle her. You may find you have to play around with your build to find that “sweet spot,” but really, it has more to do with how you battle her. The amount of times time ran out on me was ridiculous! I tried multiple builds that people recommended online, and I still found myself going to what was most comfortable. It’s going to be different per person, so let me break down some basics for you. Bring condition removal. You’ll see later why. Turn off Post-Processing Effects. Liadri can blind your entire screen. I can’t stress this enough. Maybe there’s someone out there that could beat her zoomed in, but I’d say you’re insane. Be aware of your surroundings. Turn your screen with your mouse (right-click). If you have some Endurance Regen food or sigils, I’d suggest using them once you have a handle of the battle. Do the battle a few times until you understand how it works. This is the most important part. Increasing your DPS with zerker gear may be very helpful, depending on your profession. If you get hit with an AoE or a Vision, you’re dead anyway (more on that in a bit). Liadri will be standing in the middle and is completely immune to all damage. Visions of Mortality (sort of like they’re shadows of Liadri) will slowly follow you around. One hit by these suckers and you’re dead. I heard you can blind these things. I never bothered trying. Liadri will constantly summon a massive AoE attack that will annihilate you, taking up 1/4 of the arena at a time. There will be an orange area to warn you. Don’t try blocking this, and try to even avoid dodging it if you can. The pattern is consistent, so once you get used to it, there’s no surprise. You can read all you want, but just experience it to understand (at least, that’s how I learned best). Liadri will be firing out a long ranged attack (which looks the same as the Necromancer’s Necrotic Grasp). It deals a fair amount of damage, but nothing that’s too terrifying (or so was my experience as a Guardian). White voids will appear that you must lure a Vision of Mortality into. This will turn them into an Orb of Blazing Light. Pick up said orb and fire it (using 1) at Liadri. Do this 3 times and you will move on to Phase 2 of the battle. If you can get the orbs to appear from the first 3 Visions of Mortality, then do so. The more time you have going into Phase 2, the better chance you have to win. Seriously, be careful of those stupid Cosmic Rifts. If they pull you into an AoE, it’s game over for you. Master the pattern of the AoE to make things easier. It’ll always be the same. Only use dodge when you need to. It’s helpful to keep away from those Visions when you didn’t notice one coming. Congratulations, you just royally ticked off this tiny little 5’7″ beast. Prepare to die (at least, a few times). Liadri is now mobile and gunning you down. At this point, ranged weapons are probably your friends. I’ll explain why in a bit. The AoEs begin to take up just under half of the arena, but they alternate from a North-South blast to a East-West blast. Visions keep coming, Cosmic Rifts keep appearing. You don’t need any more orbs unless you’re going for the achievement, Light up the Darkness. Make sure you have condition removal, as she’ll cripple you–very bad with the AoEs and Visions. Liadri will be assaulting you with a whip, using both long-ranged and short-ranged attacks. She’ll leap at you, so prepare to dodge. She’ll sometimes do a whirling stance. I took this opportunity to lay a Symbol of Swiftness on her, as I was playing a Guardian with a staff. She’ll keep trying to cripple you and inflict weakness. If you get crippled, be sure to clear that condition as soon as you can. AoEs will annihilate you, as will the Visions. Stay at range as much as possible and keep hitting her. Your goal is to wear her down before the time runs out. As I said before, condition removal. The cripple will kill you, hands down. Stay near the center! This was probably the most significant thing I learned. It allows you to stay just outside of the AoEs. It keeps you away from the Visions of Mortality that spawn close to the edge. It gives you a better look at what’s going on. Being constructive and not too hard on yourself is the best way to go. It’s not impossible, and it’s very rewarding when you complete it! Hopefully that helps you a little bit if you’re stuck on that evil woman. When I beat her, I was pumped and had to take a picture of my new reward! Finally, my dark little mini! 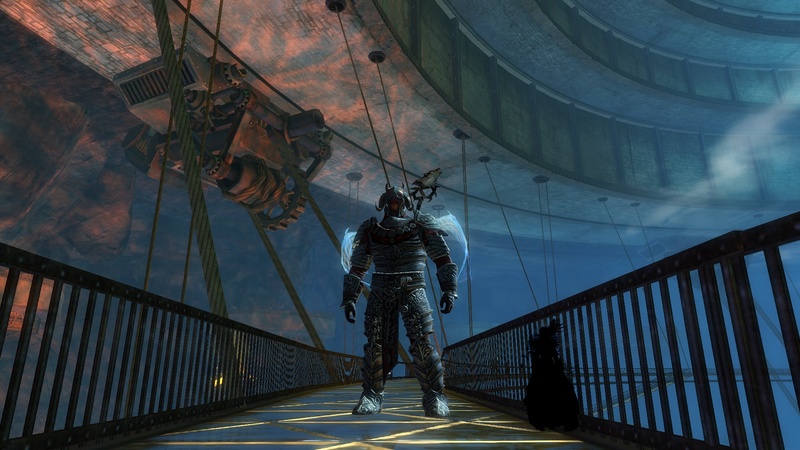 Quite a while ago, I posted about my journey towards getting an ascended weapon, which was one of the greatest feelings I’ve ever had in Guild Wars 2. I worked hard to get my weaponsmithing to 500, gather all the mats needed, and finally piece together my beautiful Zojja’s Claymore. This led to my Ascended Hammer. Now, I have my beautiful ascended armour as well (well, 3/6 pieces). It feels like an amazing achievement for me, but I have to say that it’s not for everyone. People debate all the time whether ascended gear was a good thing to be introduced into the game and to be honest, I’ve heard many complaints about ascended gear all around. One side will say that it’s just a time and money sink for the economy. Others will say it was a much-needed progression that had minor impact on your stats and gameplay, while giving us something less-accessible for gear than exotics. Regardless of where you stand on ascended weapons, it’s a heck of a lot more achievable to get a couple ascended greatswords than to craft Twilight or Sunrise (or Eternity). Although I noticed a difference in DPS with an ascended greatsword, armour has next-to-no impact. There’s very little incentive to get ascended armour unless you’re planning on doing some extremely high levels of fractals. Yet I still chose to get the gear. To be honest. one of the biggest reasons I wanted ascended armour had absolutely nothing to do with the stats. Let’s face it, an extra 1-2 points per stat on ascended armour really isn’t going to make or break your gaming experience. No, I decided to make it because I wanted to make it. Do I really need more reasons than that? Whether a person wants to collect every mini, every skin for the wardrobe, clear every dungeon at record time, fill up every bank space to 250, or collect ascended weapons and armour–it’s your story. 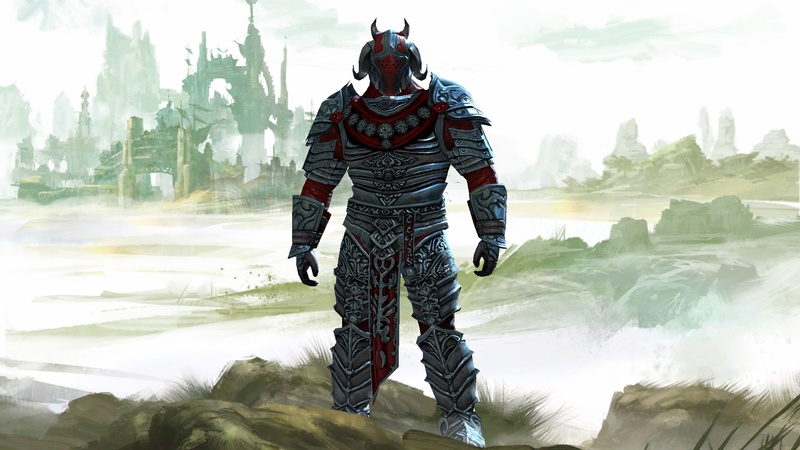 Guild Wars 2 is about forging your own path, doing things the way you want them to be done, and seeing the entire game as “endgame.” Whether you’re all about levelling alts, getting the best gear, finding rare treasure, doing jumping puzzles, WvW, sPVP, tPvP, or anything else, it’s all your choice. 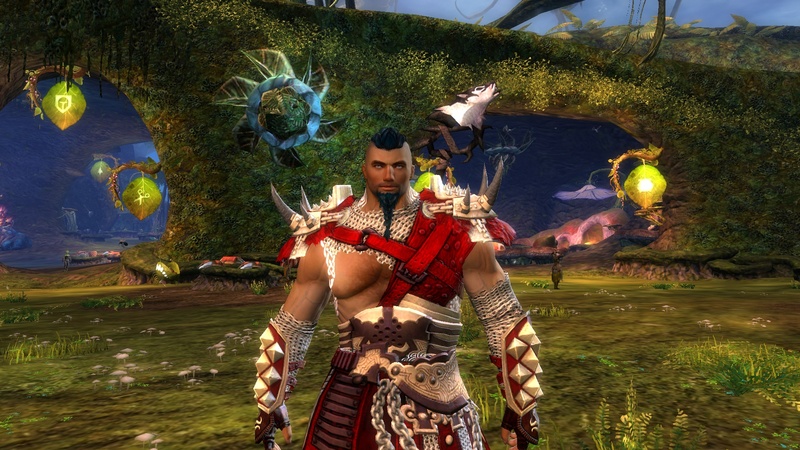 I rarely feel pigeon-holed in GW2 to do anything. Of course, this does lead me to be overwhelmed with options at times where my wife and I sit wide-eyed, asking each other: “Uhhh… so what do we want to do tonight?” Still, working towards my ascended gear has been a casual progression that “just happens” so long as I’m making the time-gated materials (Spool of Silk Thread and Lump of Mithrilium), they come together pretty easy for me. I am MIGHTY!! !… and slightly terrifying. 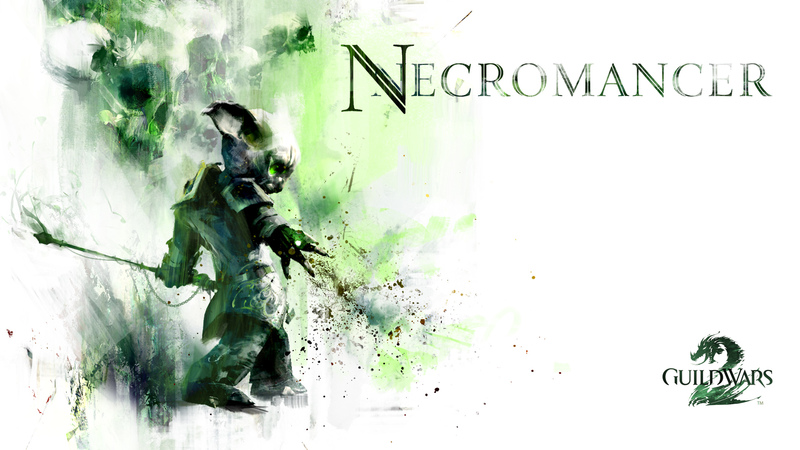 You know, when I think about fear, I’m not only thinking about what a necromancer annoyingly inflicts on me; I’m not stuck on how repetitive the Claw of Jormag can be with roaring and causing me to run in terror; I’m not pondering on the cute little flashy icon for fear in Guild Wars 2. Fear means so much more than that. Look, I’ll be honest. I’ve had some bad experiences in Guild Wars 1 with PvP, I must admit. Playing my assassin, doing pretty good in PvP, but then getting flamed out the ears (rear?) for not doing better. This led to more terror in doing PvP in other games. Sure, I had a bit of a confidence boost when I played a Cleric in Rift and had some people who consistently complimented me for being a great healer every game, but then in SWTOR I got flamed again. It came to GW2 and I dabbled here and there, but progressively became more and more terrified to try it. Even WvW, a guild had to force me to join them. What’s my issue? This flows into life as a whole, but I’m not wanting to get that deep today (even though sometimes I can’t help myself). I’m scared of letting my team down of people I’ve never met and may never see online again. I’m scared of my best not being good enough. I’m scared that somehow, I’ll make a bad name for myself and then people will mark me as someone to report and hate. Frankly, when does it matter what others think of you? Yes, I’m all for treating others with respect and approaching your relationships to one another with humility, but to fear playing poorly in PvP? For goodness sakes, I need to get a hold of myself. I guess this is a confession, that I let fear take control of even my gaming–a time to relax, breathe, and have fun! “It’s just a game,” I tell myself… but if I let myself have that same condition be applied to me tick by tick, I’m never going to become a better gamer, guardian, or person. Asmund, Slayer of Dragons and Briar’s Bane fears nothing–what about you?